Your digital audiobook copy of The Legacy Journey will be available as a download link in your order confirmation email after check-out. In this bundle, you’ll receive the Legacy Journey in both the eBook and Audiobook formats. The unabridged audiobook download is read by Dave Ramsey and runs 6 hours and 4 minutes and you can choose from three available eBook formats (iPad/iPhone, Kindle, Nook). What does the Bible really say about money? About wealth? How much does God expect you to give to others? How does wealth affect your friendships, marriage, and children? How much is "enough"? 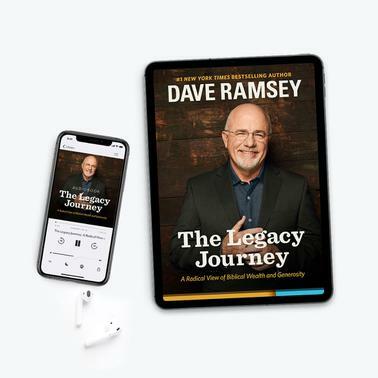 In The Legacy Journey, Dave Ramsey, takes you deep into God's Word, revealing His perspective on wealth, your personal and family legacy, and how He wants to use you to further His kingdom work around the world. You can truly live—and leave—a legacy. The journey starts today.